FREE sample of Honey Nut Cheerios: Click here to get your free sample and coupon!! FREE Sample of Carefree Ultra Protection Liners Click Here, also print off a $1 coupon! On Saturday, August 29th, get extra deals at Old Navy’s “One Day Wonder” sale. You get a free graphic tee when you purchase a pair of adult jeans for $19 (regular price is $29.50)! I forgot to mention this the other day, but Cellfire has added some even more awesome coupons that will go well with Fry's current promo. Also, don't forget that you can also go to Shortcuts.com and Frysfood.com for more coupons as well. Thanks, AFULLCUP for the list so that I didn't have to type it all up. My wrists thank you today. Did you know that you can get a Free Pei Wei meal if you're one of the first 30,000 to become a fan of Pei Wei on Facebook? 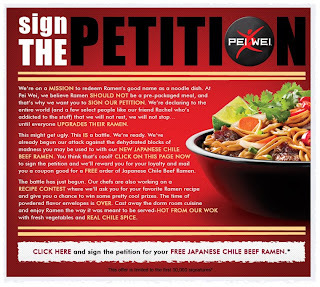 Click Log In Facebook (or on the "Upgrade Ramen" tab) and you can request a coupon for a free Japanese Chili Beef Ramen at any Pei Wei location. So far, there are a little less than 19,000 fans so there is still plenty of free food. MMMMmmmm, Pei Wei. Me love you long time. "Any purchase" inlcudes any of their trial sized items, which are around .99¢. I was reading CouponGeek (love her) and she found a blog that posted how you can post 5 items on Ebay for free every 30 days. I have sold several items on Ebay, and hate having to pay the insertion fees. If you are new to Ebay, this is a great way to get your feet wet! Go HERE to read the post by Tomorrow's Plight. THIS coupon is good for $1 off any large combo meal. Just what I needed. Walmart is offering FREE connections Hallmark Cards! All you need to do is go HERE and click on "Get a Free Card"! Get a free Beech-Nut Starter Kit HERE by filling out a simple form!! Also, Tomorrow's Plight has a post letting everyone know how to get more coupons from Beech-Nut. Read hr post HERE to see how you can request a Solid Advice Booklet by mail that has coupons in it! Also, sign up for the newsletter, HERE to receive coupons every month by email! Plus, you can get a free Parent Pack from Beech-Nut by calling: 1-800-523-6633 (8 AM-5 PM CST). The Parent Pack includes coupons and samples! Walgreens has another $5 off $25 or more purchases in-store with THIS COUPON! Free 8x10 collage at Walgreens today only. Order online if you want at walgreens.com, go to photo, select 'gifts' and choose 'collage'. Only one 8x10 per household, code FUNDAY (3.99 will come off). You can then pick it up for free at your local store! This week Safeway is quadrupling coupons up to $1.00 this week only. This means that any coupon is quadrupled, with maximum value equaling $1. Examples: A .25 coupon quadrupled = $1.00; A .50 coupon quadrupled = $1.00; A .75 coupon quadrupled = $1.00. Coupons over $1 in value are not quadrupled. Go HERE AND HERE to upload coupons directly to your Safeway card. Go HERE for the complete list of deals and coupon matchups. You can also upload coupons to your Fry's card by visiting: Cellfire, Shortcuts, or Frys. There are SEVERAL coupons available that will work well with the promo!!! The promo is still basically the same as it was last week. Go HERE to view last weeks coupon matchups for the promo. Or go HERE for the PYP list that shows the triple and quad matchups! Also the same deal for Nature Valley Granola Bars. Get the deluxe 2 disc set plus digital copy for the release-day price of the single disc! Free Super Saver Shipping on $25 orders! Bashas' doubles up to 3 like coupons every day. This means that any coupon is doubled, with maximum value equaling $1. Examples: A .25 coupon doubled = .50; A .50 coupon doubled = $1.00; A .75 coupon doubled = $1.00. Coupons over $1 in value are not doubled. Safeway will normally double coupons up to $1.00. This week, though are doing Quadruple Coupons. This means that any coupon is quadrupled, with maximum value equaling $1. Examples: A .25 coupon quadrupled = $1.00; A .50 coupon quadrupled = $1.00; A .75 coupon quadrupled = $1.00. Coupons over $1 in value are not quadrupled. Here are the "Best" Deals this week, but you can go HERE to view all. Safeway is usually one of the more expensive stores, but you might be able to get a few good deals with the quad coupons, so let us know if you find anything good! Fry's doubles manufacturer's coupons up to $1.00 unless it specifically says Do Not Double (or DND). (This means that any coupon is doubled, with maximum value equaling $1. They are not currently accepting competitor's coupons. Prices are reflected as the AFTER PROMO PRICE, assuming you bought 10 items. shortcuts.com or cellfire.com has a coupon, I think. Here are a few of their helpful links that you will not be able to live without! Coupon Basics: What every new coupon shopper needs to know. Did you know that "we coupon ladies" have our own language? 1. Order the Sunday paper at a discounted rate and print off your internet coupons. Don't know what I am talking about? Go re-read this! There are a few different ways to do this. For my tutorial, go HERE but basically, you can date in file folders or cut them out and keep them in baseball card holders in a binder in categories. Wonder if you are supposed to have a coupon for something specific? Go HERE for a continuously updated list of coupons. 3. Know the "Shopping Tricks"
Basically, just because you have a coupon for something, that doesn't mean you have to use it. Just because something is shown in an ad, that doesn't mean that it is really a good deal. Stock up on items you use when they are a good price. The more you coupon shop, the more familiar you will become with what is and isn't a good "goal price" for certain items. Albertson's does NOT double coupons but they accept other store's coupons and you don't need a store card to get their VIP prices. Stack store coupons with manufacturer coupons. You can use 1-800-FREE411 to make 100% free long distance and international phone calls! The calls are only free for 5 minutes and they will disconnect after that, but you can use this service as many times as you would like. Looks like I'll be calling Australia more often! 25% off - catch the mouse under the curtain -- put your mouse right under the first curtain fold on the right hand side. he comes out about every 20 seconds. then click right after he sticks his head out. $8/$50 - Click sandwich in little african american girl's hand on bottom. If it says a certain coupon is gone, you can always try for it later! Nestle: $20 worth of coupons and a calendar! Go HERE to get $20 worth of Nestle coupons! Random Online Deals and coupons that we like! Click HERE for a $10 off a $30 purchase at Pier 1 imports thru September 30th. FREE 10 Day Supply of Bare Minerals Matte Powder SPF 15 at any Bare Escentuals Boutique, Sephora, Sephora inside JCPenney, ULTA, or select Nordstrom, Macy’s and Spa locations. Go here to find a Location, and HERE for all the details. Origins is offering a free Skin-Brightening Mini-Facial from 8/20/09 - 8/23/09 at retail stores and 8/21/09 - 8/22/09 at department store locations. If you make a skincare purchase with your facial, you can also receive a free 6 week supply of their #1 face cleanser. Michaels Sunday, August 16th from 4 - 8pm, take this coupon with you for 25% off of your ENTIRE purchase. Mimi's Cafe Use this printable coupon at any Mimi's Cafe to get a free dessert when you spend $10 or more. Expires August 19, 2009. Valencia Juicer: Go here to fill out a short survey and you will receive a free juicer. Simple! Our new blogging friend, ArizonaSavings posted a great deal on free board games at Target. Have you ever noticed that on the back of your receipts that there's special offers on there? Pay closer attention to them and you'll be pleasantly surprised at what you can get for FREE! Here's a few things that I've found out . . .
Burger King - One FREE Whopper sandwich or Original Chicken sandwich with purchase of any size drink and fries after completing a brief survey. Panda Express - FREE entree item with the purchase of any 2-entree plate after completing a guest survey. Arby's - FREE regular Roast Beef or Beef 'n Cheddar after completing a short survey. *After you get your first FREE sandwich, you'll get another receipt and you can keep rolling them, meaning that you can do the deal over and over again - Never pay for another roast beef sandwich ever again! 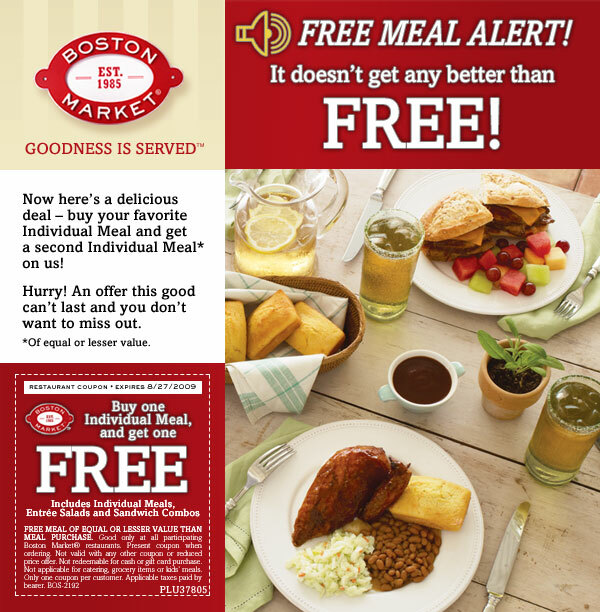 **You can also sign up for the Arby's newsletter and they will weekly email you free food coupons! Jack-in-the-Box - Sign up for Jack's Secret Society of Cool People and you'll be emailed special coupons! If you know of anymore, please let me know so that we can spread the word!! But....Today is Miracle Treat Day at Dairy Queen, which means that if you buy a BLIZZARD from Dairy Queen, 100% of the profits will go to the Phoenix Children's Hospital. In the LaVoz newspaper that you can pick up TODAY (remember, they pick up the old and put new ones in every Friday), there's some fabulous baby food Q's in it! These coupons don't expire until 12/31/09. I suggest you hunt down some LaVoz ASAP!! If you are one of the first 10,000 to respond then you will get a free Glade Fall into Fragrance Gift Pack (a warmer plus a refill)! Just go to this website and fill out the fast form. Gift packs will be mailed by October 15, 2009. Macy's has a clearance from 50% to 75% off select apparel. $10 of $50-At the Bottom, there is a "Double Takes!" frame with a girl w/a pink shirt and a blue headband. Take her headband and move it to the same model to the left with the light pink shirt on. 25% off Any In Store Purchase-Under the frame on the right hand side (Collectilitees) grab the pink Spiderman shirt and drag it to the blonde model under "They Live like Us"
10% off any in store purchase when you buy any kids item-At the bottom there is a Magazine that says "Check out Class of $10 Issue", to the left of the magazine is a yellow arrow. Click the Arrow to get the coupon. $5 off $25-In the bottom frame called "Double Takes", click on the Banana Peel (or whatever it is) in the Model's ( with the pink shirt) Hand. 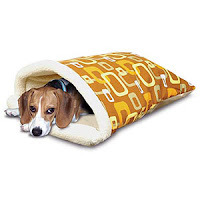 How would you like a free Dog sleeping bag?! It's for smaller dogs...how fetching cute is that?! The Walgreen's coupon that Connie told you about earlier, has been extended. The new one is good through Saturday 8/8! Also, check out Connie's post HERE on how to get super cheap Huggies Wipes! Schwan's Man: $10.00 Free Food! Schwan's is offering $10 worth of food FREE to new customers! This offer is limited to the first 500,000 that sign up, so hurry! Growing up we had a good relationship with the Schwan's man. We lived in the middle of no where and would load up on ice cream and junk! Love it! Go HERE and click on New Visitor to claim a coupon for a FREE Spaghetti at Fazoli's with a drink purchase! 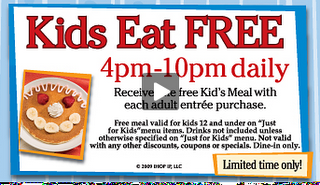 Fazoli's is also offering FREE kids meals every weekend (Saturday & Sunday) in August with the purchase of one adult entree. No coupon is necessary! Here's a printable coupon for Two FREE Tacos at Jack In The Box on August 11th . And at Ikea: At participating stores through August 16, kids eat FREE with no adult purchase needed. This offer is good for kids 12 and under only. you can get $10 off any purchase of $10 or more. Use promo code G E T 4 B T S (no spaces). I went to the women's clearance and found some tops for just $5.99 each. Buy 2 of them for $11.98 - $10 coupon code = just $1.98 for 2 cute shirts! Standard shipping is just $5.95 + tax, but just over $8.00 is great if you're needing some new clothes! That's a savings of over $30. Plus get 5% back if you're signed up for Ebates! Also, starting yesterday, August 5th you can print this JCPenney $10 off $50 dollar purchase or $15 or $75 purchase. These coupons are valid in-store, catalog or online with code on coupon. They are already having a huge 70% percent off sale! Make sure to read the exclusion on coupon. Plus, don't forget to sign up for their birthday club to recieve an extra 15-20% off during your children's birthdays! In-ad coupon: $10 Staples Gift Card when you spend $50. Staples clear glue sticks 4/pack $1 - Limit 2. Staples 3-hole binder punch $1 - Limit 2. Staples photo plus 4x6 paper 60/pack $1 after easy rebate ($9.99 - $8.99 easy rebate = $1). Limit 2 rebates. HP Office 8.5x11 copy paper 5-ream case Buy 1, Get 1 Free after easy rebate ($39.98 for 2 - $19.99 easy rebate = $19.99). Limit 2 rebates. Honey Bunches of Oats are only $1.88 @ Fry's this week. 2 DAYS ONLY! 8/5 and 8/6! Click HERE to print your coupon! Must reach purchase amount of $25.00 or more before taxes and after all manufacturer and Walgreens coupons and discounts. One coupon per customer per offer. For some fun Walgreens scenerios, check out I Heart Wags! We have a Fashion Bug close to where we live and they have some cute stuff! A friend of mine just got some super cute shirts there and I'll be heading there soon myself! Check them out at FashionBug.com! Get $10.00 off when you purchase $25.00 or more. Enter code 7 7 6 2 8 5 4 0 5 (no spaces) at checkout! Here's today's code for your FREE RedBox movie rental! Fry's gallon milk - $0.99 cents when you spend $50 in a single transaction. First 2! Otherwise $1.37 each, still cheap! Backpacks or Lunch kits - 40% off! 10 for $1.00! First 10!